Star Wars the Old Republic or SWTOR has been the latest online game installment of the Star Wars Franchise. And we’ve come a long way since Star Wars Galaxies. I was really hyped about this game for it is a sequel to Kotor 1 and Kotor 2. Now what time frame after Kotor 2 I don’t know but since Revan does make an appearance in the game and he is mentioned in the SWTOR Galatic Timeline Records. Please note I’m not much of a PC gamer so please don’t go to hard on me for this is just my opinion of the game. The gameplay was rather enjoyable to me. 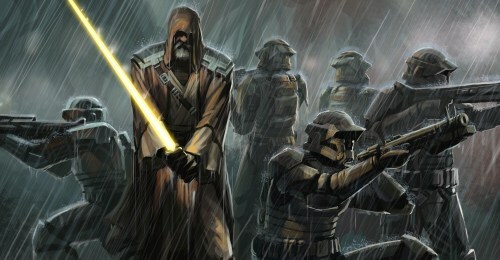 I choose the class Jedi Knight Sentinel and dual wielded yellow and blue lightsabers. Gameplay was rather easy to catch on to. Simple customization of your abilities and force powers. Though naturally you will only get the best experience if you pay the subscription of the game. From having companions to travel with you to even joining groups at will is very enjoyable as you can simply help each other with whatever missions you’re trying to complete. Even if the mission doesn’t count towards your class you still get experience points which I thought was pretty sweet. But if you’re not a subscriber I would highly recommend doing those side missions and helping others since being a free player doesn’t come with many perks. I’ve always enjoyed the flashpoint missions. In short the flashpoint missions is having a squad from available players and you all set out to complete the mission. Which I think is great for the sake of building good co-op players you can count on in the future. A word of caution, just make sure you’re well equipped or least play with someone who knows what they’re doing. Yes most of the times I was the straggler since well…hardware wise my laptop is only so powerful and it isn’t particularity gaming friendly. I say this to relate to those who are still curious about PC gaming but hold a dedication to console gaming and primarily who don’t have the hardware to fully enjoy PC gaming. To recap on what I mentioned earlier you have a lot of classes you can play as, which I think was the game developers main concern for I recall talking with a buddy of mine who was a big fan of Star Wars Galaxies. And how not everyone could be a Jedi or Sith. But once the opportunity was present you could start as a padawan for example and work your way up. And because of this it made you much more of a threat because not everyone can up and choose to be a Jedi or Sith like SWTOR. To capture what I’m saying, my friend witness how he and his squad struggled just to take out a Jedi. Which would make you wonder how hard it had been if they were to fight a Jedi Knight or Jedi Master. But SWTOR seems to have evened out the playing field for everyone which I see a lot happening now in the gaming world. Like Super Smash Bros Brawl or Mario Kart. But I’ll talk more about that another time. You do get companions and you can customize them as well. If it were me when I play through as a Sith I’m going to get a miraluka as a companion 😉 ANYWAYS moving on, the customization is impressive to me for I think you practically customize everything from your gear, lightsaber colors, skills outside of battle and the list is endless. If you’re looking for something to kill time with then the SWTOR crew skills is something worth looking into. Though me personally I didn’t get to far with it as a free player but I highly suggest looking into that especially if you’re into customizing your weapons, armor etc the way you want it. All of these customization options will fill in the time, best believe that. Even if you don’t care about all that you can be a merchant and sell your finds, items and gear. Or you can buy anything you think you couldn’t get on your own. So yes, you are literally being sucked into another universe you can lose yourself in. The music in this game in my opinion is pretty average. And many would agree with me since John Williams didn’t help with the ost. Some of the new songs were pretty epic but I wasn’t really impressed since many songs I heard during gameplay were recycled from Kotor 2 like Aboard the Ebon Hawk or the theme of Dxun. I even recall the voice of Master Kavar from Kotor 2 being somewhere in the Sith Knight storyline. So music wise I feel a bit let down but at the same time I did enjoy rekindling memories from old star wars games. But the recycling of songs from the Star Wars trilogy I don’t mind because like most Star Wars songs they are timeless. They will never grow old. But here’s the youtube link to the SWTOR OST. It was kind of hard to give my opinion on this game for thing is, not everyone has the necessary equipment to enjoy PC gaming like myself. But here at Next Door Gamer we will do our best to cover more than just PC gaming. Overall, SWTOR has quiet enjoyable or at least I found it very enjoyable. I was able to get up to level 50 so for those of you who were concerned about not being able to play the entire game without paying money you can get through your whole storyline as a free player but just know I suggest you do extra training for you do not gain the same amount of experience than paid players. Once you’ve completed your Class story line you can easily start over in a new class be it bounty hunter, Jedi, Sith, smuggler you name it. SWTOR has been a very enjoyable MMORPG and you can download the game for free at the SWTOR website.